Another CASE study featuring another fabulous creation from our muse, Julee Tilman. Let's see what's up for CASEing this week, shall we? Check out Julee's original post for this card here! 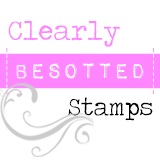 Up for grabs this week on CASE study is a $15 gift certificate to spend at Amber Ink which has a fab selection of clear and digi-stamps. So why not join in the inky fun? Now I'm pretty sure that the rest of the CASE study DT made their cards for the right week and didn't find themselves in the mad panic I was in! Why not check out their awesome creations? So from one mad panic to the next for me: tackling the huge amount of stuff around here to put in boxes before we move next week - eek! I love you're lil cutie pie card! Such a sweet card! Love the subtle telephone in the background and that lace and border just sets it off beautifully! Love it! Aren't mini cards life savers? LOL...that is something I would do...I'd be sitting there all proud of myself that I was done early...but you need to rush yourself more often. I love, love, love, this card! Hero Arts = happiness! Hey at least you have next weeks card out of the way which sounds like a good thing! 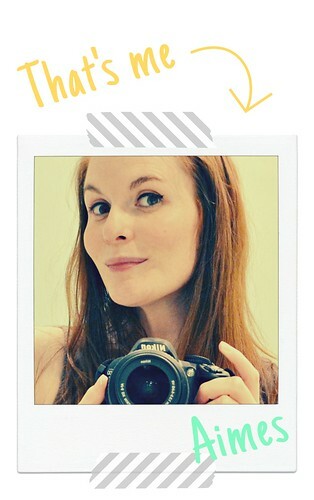 Loving your mini card, you deffinately rock those pint sized beauties! Fab mini card! Love it! Best of luck with the move. Love your simple take on the inspiration card! This really stuck out to me in the list of participants thumbnails! Simple yet packs a punch! What a sweet little card, I especially like those colors together. Well, girl, you do great work under pressure!!! This is FABULOUS and does ABSOLUTE justice to the inspiration piece! And bonus on the edge distressing indeed! Gorgeous card girl! Good luck with the move! A perfect CASE Amy, and I love how little it is. Something about small cards just tickles my fancy. Adorable! What a cutie 3x3 card! I am all into dots so this really grabs me. Love it! Had to have a little chuckle about you getting your weeks mixed up- that is something I would do!!! The card you have 'whipped' up is brilliant, love the shadow of the phone behind the sentiment!! This is totally adorable! I love the trim in the background! Loving the colors on this! I hope you've packed some (if not all) boxes by now. Your card is beautiful, Aimes. Love your style. This is beautiful Aimes! 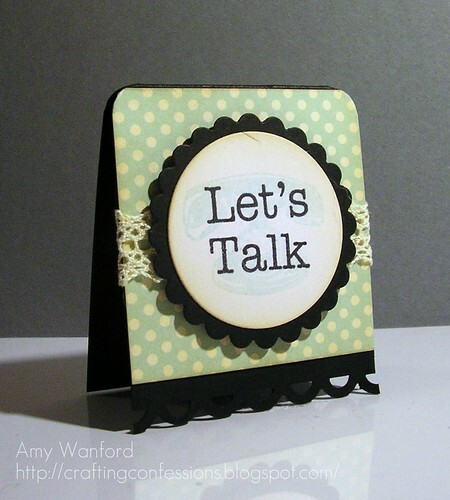 I love the trim and the gorgeous Polka Dots ... but the use of the sentiment right over the image is totally fabby! I really hope your move goes well - this must be the most *incredibly* overwrought time for you! HUGS! Another phone beauty!! I love how you overstamped the sentiment on the phone! Love that technique!